"Maine lawmakers gave final approval Thursday to House Majority Leader Erin Herbig’s bill to create a monument honoring Maine’s Gold Star families in Capitol Park." "Maine veterans can now receive a free lifetime pass for state parks and the state museum. A new law [sponsored by Rep. Erin Herbig] allows veterans free admission to the Maine State Museum." "The Maine House overrode the governor’s veto Monday of a proposal by House Majority Leader Erin Herbig to protect services for Mainers with intellectual disabilities and autism." 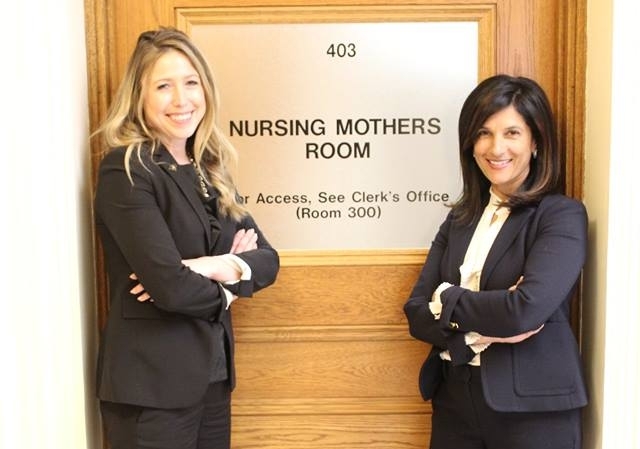 "In Maine, a bill from Democratic state Rep. Erin Herbig of Belfast and Republican state Sen. Amy Volk of Scarborough would study an employer-funded paid leave program. The cost of becoming a parent has been increasing for decades, and it’s these kinds of actions that would reverse a trend that is hurting families." "On Saturday, Sen. Michael Thibodeau, R-Waldo, and Rep. Erin Herbig, D-Belfast, read remarks commending the sacrifices of veterans. Both representatives were candidates for their current seats when they attended the Armistice Bridge dedication in 2010." "House Majority Leader Erin Herbig, D-Belfast, also issued a statement: "Women face daily challenges that threaten their ability to stay in the workforce. The pay gap coupled with a lack of affordable child care and sick leave make working full time as a mother difficult for most and impossible for some. The strength of Maine's economy depends on women and men pulling ahead together and right now, we're not doing enough to make that possible." "A bipartisan bill would commit $1 million in annual funding to the issue. LD 1845 would pay for upgrades to outdated training facilities and help build new ones in communities lacking them. "It's time to put our money where our mouth is," said Rep. Erin Herbig (D-Belfast), a co-sponsor of the legislation. "How can we ask firefighters to put their lives on the line when we are not willing to offer the training they need to protect themselves?" "Only a fraction of Maine's 186 legislators are under the age of 40, but they are hoping to encourage more young people to join them. That is one of the goals of the new Maine Future Caucus, which debuted at the Maine State House Wednesday morning. The group of under-40 legislators, led by House Democratic leader Rep. Erin Herbig (37 years old) and GOP Rep. Matt Pouliot (31), is affiliated with a national movement called the Millennial Action Project." "While political fights may get all the news headlines, in the Legislature there are often issues that unite us regardless of party affiliation because they’re just so important. The worsening crisis in Maine home and community-based services and intellectual and developmental disabilities services and autism is one of those issues. It’s why we, a Democrat from Belfast and a Republican from New Gloucester, have come together in support of legislation to finish the work we’ve done to address the root causes." "The two bills go very well together. The bill that I presented creates a change in statute that a victim is notified if their perpetrator escapes either jail or a mental institute," said Rep. Erin Herbig, (D) Belfast." "This is Maine taxpayer money that we will be accepting back from the federal government and it will not be going to other states. 40 other states have implemented this. They haven't gone bankrupt. This is a good opportunity for Maine to provide desperately needed healthcare," said Rep. Erin Herbig, (D) House Majority Leader." "The first and most important thing they said and showed me at each of their businesses was something I already knew. Businesses are succeeding in Waldo County. They are creating good-paying jobs and opportunities to build a career. Despite some doomsday media and negative politicians, there are good things happening in rural Maine that we should all be proud of." "And, I promised to make sure more people know that." “We are in a state of crisis at this point,” says House Democratic Leader Erin Herbig of Belfast. “I have visited over 50 employers in Waldo County over the last month and a half, and virtually every single one said, ‘My No. 1 concern is I am having trouble hiring people." "Herbig first ran for the Legislature in 2010 on a platform that included a desire to slow the exodus of young people leaving the state to find work. That problem persists, she said, but it also might be that workers don't know about the variety of jobs that exist locally." "I grew up here and I knew I could be a dental hygienist, a bank teller or a teacher, because those were the jobs I could see," she said, adding that employers like InnovaSea are doing inspiring work, but mostly out of sight." "Maine House Majority Leader, Erin Herbig (D - Belfast) launched her "Waldo County Works" business tour. She's visiting local businesses around Waldo County to discover ways to help their industry grow." "This is all about having having conversations with business owners, with the families that own them, with the people that work there because we need to know that the policies in Augusta are working for the rural part of the state, not just in Southern Maine," said Herbig." "We fought for and secured $162 million in new funding for public schools statewide which includes more than $3.16 million for Waldo County schools. When towns aren’t faced with cutting public services or school funding to make ends meet, they’re less likely to be forced to increase property taxes to make up the gap. Already we’re witnessing the result of our investment in public schools." "Through my work this year as the House majority leader, I have learned that in divided government, compromise is always necessary. I know that for families in Waldo County, it doesn’t matter if you’re a Democrat or a Republican; it’s whether or not you can get the job done. In the end, we did our job and passed a bipartisan budget that will result in progress for all Maine families." "House Majority Leader Erin Herbig, D-Belfast, has seen several of her bills pass the House and Senate this session, three of which have been signed into law." "In the Legislature, there are often issues that unite us, regardless of party affiliation, because the cause demands it. The worsening crisis in Maine’s intellectual and developmental disability services system is one of those issues. It’s why we, a Democrat from Belfast and a Republican from Hancock, have come together in support of emergency legislation to address the root causes." Fund group homes so Maine doesn’t abandon people with disabilities. “This is something we hear in Waldo, we hear in Aroostook, and we hear in York: that people are being crushed by property taxes," she said, "and that is something we take very seriously." "Herbig said the proposal also focuses on economic growth and job growth, pre-K through college education, and Maine families (by supporting the elderly, people with disabilities, and veterans, and by expanding prevention and treatment to address the opiate crisis)."